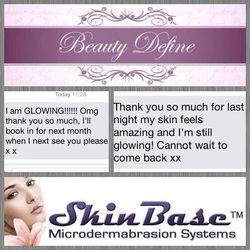 Microdermabrasion is a system of intense exfoliation and resurfacing using ultra fine crystals that rejuvenate the skin. The crystals work as a gentle abrasive on the skin to remove dead skin cells layer by layer. The vacuum action of the machine stimulates the circulatino and promotes increased blood flow to the area. The production of collagen and elastin is stimulated, which results in a firmer, more youthful looking skin. appearanace of the skin giving skin a healthy glow and youthful appearance. Microdermabrasion is also effective at treating a number of skin problems. up will go on much more smoothly. Microdermabrasion can treat: Acne and Acne scarring, fine lines and wrinkles, dull and tired skin, cellulite, pigmentation and blemishes.